Floor installation and refinishing in Dayton,Kettering,Centerville and Beavercreek Ohio is readily available through Little Floor Refinishing. Our staff is always prompt, professional and courteous. We are fully insured for our customers protection. Floor installation and refinishing projects are unique to the product being used. If your looking for expert installation or floor refinishing your search will take very "little" effort. You have arrived to the website of the most experienced and knowledgeable floor installation and refinishing company in the Dayton Ohio area. When your floors are a bore all they may need is a " little" attention. Some of the types of flooring that are available are outlined in this page. We offer a free estimate anywhere in the Dayton, OH area. Dependent upon the installation and finishing process, with close attention by the installer and finisher to a number of details prior to and during the actual installation and finishing process. are a beautiful and natural product that sets it apart from other floor coverings. Little Floor Refinishing has been achieving successful finishing of various types of hardwood flooring since 1951. This information is generally applicable to the finishing of most hardwood flooring products. With today's technological advances, in regards to finishes, techniques and finishing equipment, we will attempt to help you understand the many steps involved in refinishing/finishing of wood floors as the accepted methods used throughout the Wood Floor Industry. When shopping for Wood Floors, remember this is a life long product of natural beauty and durability. Other positive aspect of wood flooring: its affordability, easy to maintain, environmental soundness, and they are healthy for you, not to mention the wide variety and selection. From Its sustainable source to its healthy qualities indoors, wood flooring makes a smart choice for the world's environment and the environment in your own home. Laminate flooring is a hybrid. It looks like hardwood but it's not. Yet it's not vinyl tiling and it's not engineered flooring. Yet--it's a little of all of those things. Some people love laminate flooring because it's easy to install--you can install several hundred square feet in a weekend. It's easy to clean, too. Laminate flooring is often known by its brand name, Pergo. Yet there are plenty of other manufacturers: Dupont, Mannington, Armstrong. See a pattern here? Laminate flooring is mainly manufactured by companies that make synthetic floor coverings. Put your face right up to laminiate flooring--looks like real wood, doesn't it? Use a magnifying glass. Amazing! That's because laminate flooring is a surface layer of two thin sheets of paper impregnated with melamine. This surface layer is a photograph of wood grain, not real wood, and is usually covered by a hard transparent layer impervious to dogs, chairs, high heels, you name it. Under the wood-grain photograph is about a half-inch of wood-chip composite. So, sure--it's wood. In theory. And herein lie both the strong and weak points of laminate flooring. The strong point is that you can replicate practically anything on this Earth through a photograph, even the most costly Italian marble. The weak point is that it is fake. Laminate flooring planks, depending on the type you buy, are either snapped together or glued together. The "snap-together" kind is easier to install but not as structurally sound as the "glue-together" type. Also, the "glue-together" type resists moisture better. Affordable: Wood floors add value to your residence at resale time, not to mention it is a lifetime product. They increase in value as your home does. Hardwood floor products are one of the most sought after hard surface flooring in remolding and new home construction. Easy to Maintain: Routine maintenance is a little more than simple sweeping and vacuuming, always making sure your hardwood floors are protected from moisture and heavy wear which creates scratches. Preventive maintenance like area rugs, floor protectors (on ALL furniture on your hardwood floors), and routine maintenance with proper hardwood floor cleaner should always be exercised (improper products can contribute to additional wear, may VOID your warranty, and cause failure when recoating. Ecological Sound: Unlike most floor coverings, wood floors come from a natural resource that is sustainable. Long gone are the days when timber was cut down with little thought for the long term consequences on the nation's forests. Today most timber is cut from forests that are carefully managed to ensure continued resources in the future. In fact, according to U.S. Forest Service statistics, almost twice as much hardwood timber Is added every year through new growth as is harvested. Additionally, there is more standing hardwood timber today than there was 50 years ago. Healthy: The Environmental Protection Agency has said that indoor air quality is one of our top health threats. Installed in the home or elsewhere, wood floors help contribute to a healthy living environment. Hard surface flooring such as hardwood floors does not trap or harbor dust mites or molds. That creates better air quality for all inhabitants, but especially for the estimated 35 million Americans who suffer from allergies. The hard surface of wood floors also helps avoid artificial substances such as pesticides that can accumulate on some floor coverings. A recent EPA study found that pesticides used in gardens and homes accumulate on floors and other surfaces in the home, but that wood floors greatly reduce the accumulation of such toxins. Another concern for the home environment is the off-gassing of toxins that results from some synthetic materials. Any of these chemicals can make people in the home chronically ill. Selection and Variety: With today's technologically advanced manufacturing, stains and finishes, hardwood floors come in many sizes, styles, colors, finishes and species. These many choices can compliment any home or office with style and a beautiful product that last a lifetime. 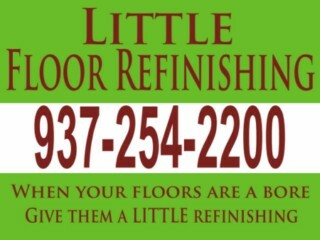 Give your floor installation and refinishing needs a "LITTLE" attention.